The Bitcoin Trader software and automated trading app is a new viral scam which is getting some serious attention over the internet these days. This is mainly due to the fact that savvy internet marketers are using intermediate sales pages using the identities of well-known actors and celebrities from the Shark Tank and Dragons Den in order to lend a seemingly legitimate aura to the destination pages. In this case it is Bitcoin Trader and Bitcoin Code. Both of which have been proven to be confirmed crypto scams and get-rich-quick schemes designed with the single and malicious intent of defrauding unsuspecting victims looking for a legit money-making opportunity. Very quickly we have seen the numbers of views as well as complaints and hype peak and reach record levels as a plethora of affiliate networks and media companies such as Clicksure and Max Bounty have jumped on this gravy train and are now providing online promoters with a variety of marketing tools such as banner adds, text links, and tracking links which monitor the campaign performance and measure income for the affiliates as well as vendors who ultimately receive the customers and charge their credit card superfluous amounts of money without getting approval (in other words stealing their money). 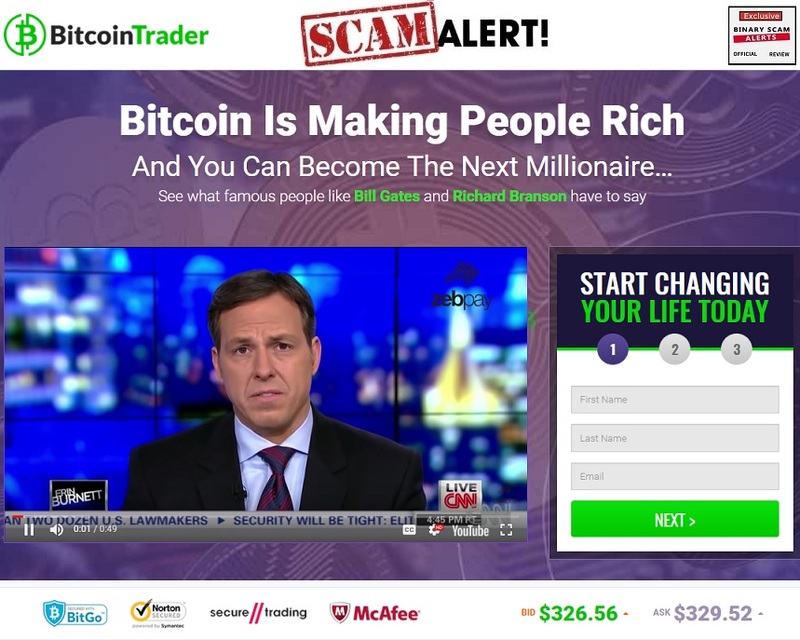 The image below is how to main sales page for Bitcoin Trader looks like, and it immediately starts off by saying “you can become the next millionaire”. It also makes a lot of out-of-context statements about how famous people like Bill Gates and Richard Branson in order to further legitimize this fake app and automated trading system. In essence, the Bitcoin Trader is a bitcoin investment scam that makes fallacious and outrageous claims about how you can generate massive profits easily. The service guarantees $13,000 a month without any risk to your investment since the developers of this trashy software have a “unique trading system which wins trades with 99.4% accuracy” (if you believe that). In the Bitcoin Trader sales video we see snippets from real news broadcasts taken out of context of course. And we hear Jake Tapper from CNN explaining how Bitcoin has peaked and how Bitcoin is the future of money “with no fees, no banks, and no inflation”. In a nutshell, much similar to the Bitcoin Code, Bitcoin Trader is using all the recent media hype in order to trick, deceive, and manipulate innocent opportunity seekers into funding offshore trading accounts with phony Forex and CFD brokers. This is done so that the promoters receive their affiliate commissions and the brokers get to milk you dry and rip you off in a very extreme and unethical manner. In short, everyone makes money and the customers pay for the ride. Final recommendation is to avoid the Bitcoin Trader scam as it is a dangerous crypto scam.